(noun) A contrasting color on the side of a bird's bill that gives the appearance of smiling, grinning or sneering. The grin patch is an unusual part of a bird's bill structure, but unlike a human smile, it has nothing to do with a facial expression that indicates emotion. The patch is simply a curvature on the side of the bird's bill where the upper and lower mandibles meet that is a contrasting color as if the bird was smiling. Unlike human and other mammalian lips, the grin patch is not flexible and does not change shape. The exact purpose of the grin patch has not been well studied, but in the birds that do possess a prominent grin, it may help by exposing the lamellae so the bird can get a better grip on food as it forages. The patch may also serve a purpose for birds to more easily recognize others of their species, including recognizing mates or indicating stronger health or dominance. Few birds have a true, prominent grin patch, but it is found on a variety of geese and swans, as well as several penguins. 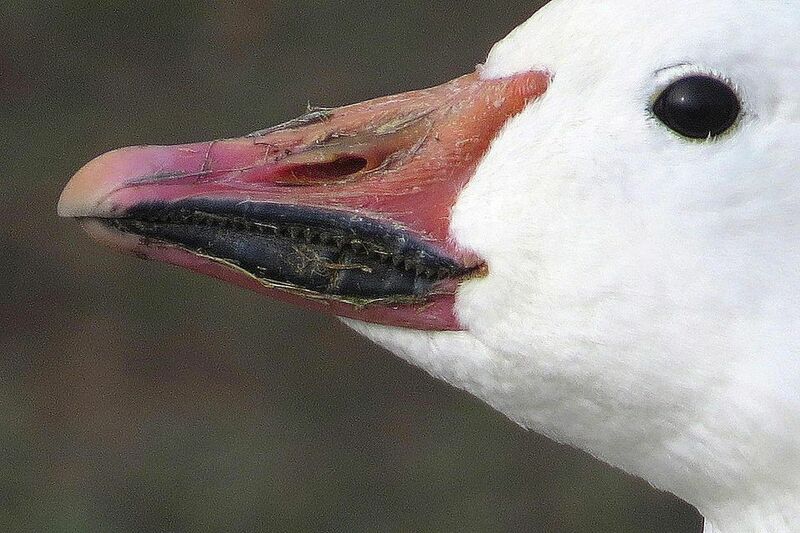 The snow goose, including the blue morph subspecies, and the tundra swan both have distinct grin patches, and hybrids that involve one of these species often show a grin patch as well. Other goose species, including the Ross's goose, have variable grin patches, but they are not always easily visible. In some waterfowl, especially domestic hybrids, the grin patch structure may exist, but it lacks the contrasting coloration and is difficult to see except at close range. The grin patch could easily be confused with other bill structures, and it is important for birders to recognize the differences in these bird bill parts so the grin can be more easily noted. Gape: The base of the bill at the corner where the upper and lower mandibles meet. In some species, the gape may be a different color and could look similar to a grin patch, but it is set at the very back of the bill rather than along the side as a grin would be. Nail: A small knob or bump at the tip of the bill, particularly noticeable in waterfowl such as geese, swans and ducks. Like the grin patch, the nail may be a contrasting color, but it is at the very end or tip of the bill rather than along the side. Nares: A bird's nostrils are often visible on the bill, and depending on the species, the elongated nares may seem to be a different color than the bill and could resemble a grin patch. The nares are an actual opening in the bill, however, rather than a part of the structure. Lamellae: These tooth-like structures may give a bill a serrated appearance, but not quite a grin. The lamellae are not usually as boldly contrasting as a grin patch, and they are even rather than curved. The grin patch may expose the lamellae, however, so the two structures could be seen together. Because few birds have a prominent grin patch, this unique bill feature can be a key field mark. If one is seen, birders should note the color of the patch and how strongly it contrasts with the general bill color. The overall patch length, width and curvature can also be good identification clues. The angle at which a bird is viewed and how its bill is held can affect the appearance of the grin patch, however, and it should be noted whether the bird's bill is smudged with dirt or food and whether the bill is open or closed, any of which can alter how the grin looks. Juvenile birds may also not show as strong a grin patch as mature adults.